When the nascent Jewish community returned from exile in Babylon circa 515 BCE, the Temple was rebuilt and rededicated. The Second Temple stood for approximately 500 years. During the Second Temple period, the religious practices that emerged during earlier Israelite Biblical history (particularly the Israelites’ slavery in Egypt, kingship in Israel and Judah, and conquest and exile by the Assyrians and Babylonians) became further developed and refined into a more formal, post-Biblical Jewish identity. The development of what we know as Judaism today took place late in this period, as the religious leadership of the rabbis emerged. After the destruction of the Second Temple by the Romans in the year 70 CE and during the subsequent exile of the Jews from the land of Israel once again, the rabbis confirmed and remodeled Jewish practice into some of the systems more contemporary Jews may recognize today. Translating the laws of the Torah into a new cultural language, the rabbis established a comprehensive ethical system that ordered the entire life of the Jewish people. Rabbinic Judaism is therefore built upon the Torah’s commandments (mitzvot in the plural and mitzvah in the singular), encouraging Jews to serve God in manifold ways both ritual and ethical. The mitzvot concern both one’s relationship with God and with other people. As one of the early rabbis put it: “The entire world stands on three things: the Torah, the service of God, and acts of loving kindness” (Pirkei Avot [Ethics of the Fathers] 1:2). The rabbis were deeply concerned with ethics and morality, drawing on the dictates of Torah and its prophetic calls for justice. An entire tractate of oral Torah tradition, the Mishnah, is devoted to rabbinic ethics. When Rabbi Hillel was asked to summarize the Torah, he wrote: “Whatever is hateful to you, do not do to your neighbor. That is the entire Torah. The rest is commentary. Now go and study.” This famous advice, preserved in the Babylonian Talmud, invokes the Biblical exhortation “to love your neighbor as yourself” (Leviticus 19:18). One essential category of ethical mitzvot falls under the rubric of tzedakah, the acts of responsibility through which one expresses a commitment to social justice. Often erroneously translated as “charity,” tzedakah is a far broader term expressing not only charity, but all righteous social conduct. Within the ethical world of tzedakah, therefore, the term mitzvah refers to an ethical behavior; a mitzvah is a “good deed.” Yet in the Jewish religious tradition, the mitzvot are more often construed as holy deeds—the particular responsibilities and prohibitions that shape the daily life of an observant Jew. As a whole, the great religious innovation of the rabbis was to adapt the divine service of the priesthood for the use of the entire people, thereby democratizing the obligations and the experience of a life of holiness. By transforming Biblical precedents into a practical religiosity, the early rabbis succeeded in transferring the locus of Jewish religion from the Temple in Jerusalem into the synagogue and home. For a community frequently in exile around the world, even into the twenty-first century, Jewish holy time and space does not require the Temple itself, but exists in the framework of the shul (the Yiddish word for synagogue) and the observant Jewish home. The central mitzvah of the Jewish home is kashrut, derived from the extensive biblical dietary laws which distinguish those foods that are fit for consumption from those unfit (treyfa). The laws of kashrut may seem arbitrary from a modern or non-Jewish perspective, but the distinctions had underlying rationale in the Biblical and rabbinical context. The fact that peaceable grazing animals such as sheep and cows may be eaten, while violent game animals are prohibited, seems to rest on a social distinction between peace and violence in human society; in other words, one is what one eats. More pertinently, what is kosher is related to the dominant theme of the Torah, namely the ritual distinction between the pure and the impure. To demonstrate the importance of the concept for the ordinary Jew, rabbis elaborated upon the biblical laws of kashrut at great length. For example, the Biblical prohibition against “seething a kid goat in its mother’s milk” found in Exodus 23:19 was interpreted as not mixing meat and dairy products in general, and often requiring separate utensils in specific circumstances. Serving as a constant reminder of the Jewish covenant with God at every meal, kashrut remains one of the most scrupulously-kept commandments among contemporary Jews, despite its inconvenience in modern settings. Given that a major contribution of the rabbis was to reconstruct Judaism and enable Jewish worship without its central Temple, a new institution was developed to take the Temple’s place: the synagogue (bet knesset, or “house of assembly”). As a decentralized house of God open to all the people, the synagogue was a radical innovation in the history of religions, and eventually served as the model for both the Christian church and the Islamic mosque. Synagogues first arose in the Jewish Diaspora prior to the first destruction of the Temple and emerged as the main institution of Jewish life during the Rabbinic era. The synagogue’s earliest function was as a meeting hall for the teaching of Torah, but the rabbis also developed the space for public worship and liturgy. 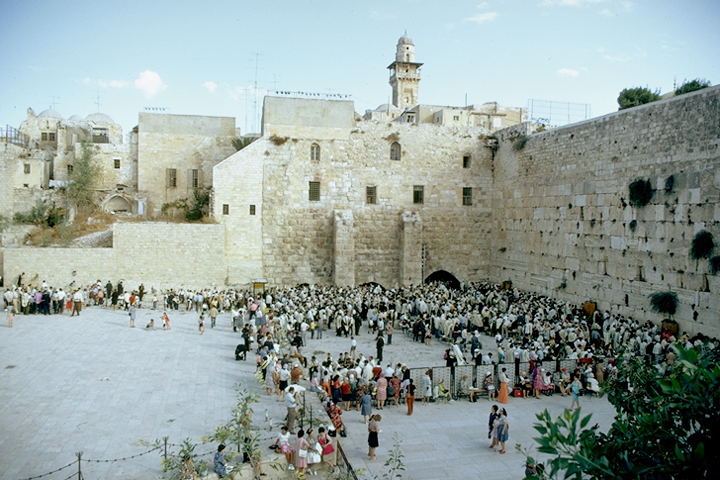 As the synagogue replaced the Temple, the prayer service came to replace the sacrificial service of the Temple, both conceptualized as offerings to God. The rabbinic mitzvah of prayer (tefilah) ordered in the liturgy of the siddur (“prayer book”) has become a principal activity of Jewish religious life, which includes worship three times daily and on Shabbat and holidays. Likewise, the holy space of the Temple was also replaced by the yearly cycle of Jewish holidays and the Jewish emphasis on sacred time. The major holidays during the Temple period were the three pilgrimage festivals of Sukkot, Pesach (“Passover”), and Shavuot. All originated as agricultural festivals, later reinterpreted to commemorate the liberation from slavery in Egypt (Sukkot and Pesach) and the receiving of the Torah at Sinai (Shavuot). Having lost the rituals of pilgrimage and sacrifice when the Temple was destroyed, the rabbis reimagined these observances for the synagogue and home. For Sukkot, they adopted and reinterpreted the folk custom of building outdoor huts, recalling the sojourn of the people of Israel in the wilderness after their exodus from Egypt. For Pesach, they formalized the family feast to include a ritual retelling of the Exodus story in the Passover seder. Other holidays soon became centered in the synagogue and home: the new year cycle of Rosh Hashanah, Yom Kippur, Sukkot, and Simchat Torah were all given extensive liturgical treatment. Rabbis developed additional holidays based on later historical experiences of the people of Israel: Purim celebrated the legendary rescue of Persian Jewry from destruction as described in the Book of Esther. Hanukkah was created to commemorate the victory of the Maccabees over the Hellenists in the second century BCE. In these cases, the rabbis gave new spiritual meaning to already popular celebrations, turning merrymaking into the sacred fulfillment of mitzvot. The mitzvah of Shabbat (keeping holy the Sabbath or seventh day of the week) is an expression of both the sacrality of the Jewish home and synagogue as well as the significance of Jewish holidays and time. The weekly holy day of rest expresses the distinction between holy and profane. Building upon the Biblical injunction of Exodus 20:8 to “remember the Sabbath day to keep it holy,” the rabbis instituted an elaborate set of laws designed to emphasize the separateness between the Sabbath (a day of spiritual reflection) and the rest of the working week. To highlight the holiness of the day, rabbinical authorities adapted the priestly prohibitions against doing certain kinds of work during the building of the Temple. On Shabbat, therefore, the most observant Jews refrain from traveling long distances, carrying large items, lighting fires (or today, using electricity), creating anything tangible, or doing any number of other mundane tasks. The day is marked by special synagogue services, the public reading of the Torah portion, independent Torah study, and family meals. To rationalize the mitzvah of resting from work, the rabbis gave Shabbat the role of commemorating both God’s creation of the world and the liberation from Egypt. Shabbat is also understood allegorically as the beloved of Israel, the time when the feminine presence of God (called the shechina) descends to the world as the Sabbath queen or Sabbath bride. Her coming and going are marked by special home observances: kabbalat Shabbat on Friday evening and havdalah on Saturday evening, each marked by lighting candles, blessing wine, and singing hymns. The centrality of Shabbat throughout Jewish history is expressed by the saying commonly attributed to Ahad Ha-am (1856-1927) and frequently quoted by Jews today: “More than the Jews have preserved the Sabbath, the Sabbath has preserved the Jews.” The same may be said of all the mitzvot: as they are kept by observant Jews, they also serve to keep the community together, responsible to one another and to God.